A piece of cookware that can be used in the kitchen, placed on the top of the stove or in the oven to smoke meats. 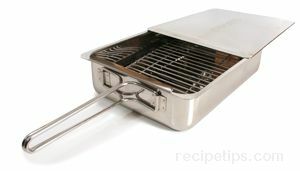 Consisting of some type of enclosed container, the Stovetop Smoker may be made similar to a Dutch oven or as a rectangular low sided cake pan with a lid. The Oven Smoker however, is made from a flexible reflective, ovenproof material formed and sealed into the shape of a 3-sided bag. Stovetop Smokers contain a rack that fits inside the smoker pan so the food remains above the wood chips placed beneath the food as it smokes. Wood chips are available in different aromas to satisfy the flavors desired from various foods. The food is then placed on the rack, the lid is closed, and heat is applied to cause wood to start smoking. Different in concept, the Oven Smoker has particles of wood and sweet seasonings (wood syrup and sugars) enclosed in the walls of the bag. As the bag is heated, the contents in the bag walls begin to be emitted as the wood begins to smoke and the seasonings penetrate the food. Smoke and excess heat is released through holes that are perforated in the bag. When using a stovetop smoker, the exhaust fan must be strong enough to adequately remove the smoke. Some smoker pans may allow too much smoke to escape, so it is wise to consider this potential problem before purchasing a smoker. There are a variety of foods that can be smoked such as pork, poultry, fish, and ribs.